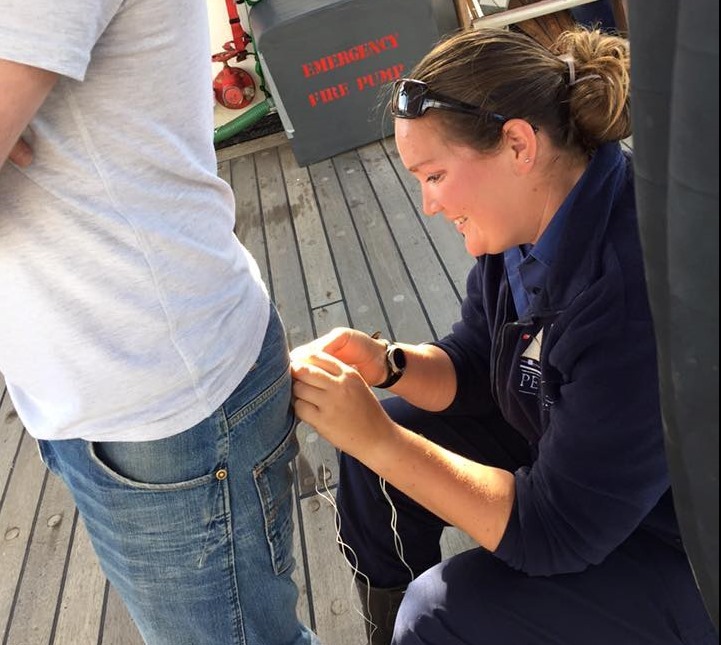 Working on a ship where things get a lot of sun and salt damage and being the token sewer onboard I do end up mending a lot of things, from peoples trousers (whilst they are still wearing them sometimes) to sewing the captains buttons back on! Sometimes I even take clothing in or up and am quite lucky that we have a sewing machine onboard that I can use if I really need to. Its fairly elderly (read very) and only does straight stitch, but is useful for a number of things, but a lot of the time I will hand stitch which is quite nice as I don’t really do much of this when I’m at home. A lot of my clothes at the minute have come form second hand shops or from the ‘rag bag’ on ship, I love shopping at second hand shops partly because I can pick up some good bargains but also that you are not really at the mercy of fashion trends. All sorts of clothes are to be found in charity shops from really retro or vintage styles right up to bang on trend items, generally I’m not a fan of the fashion trends at the moment so it is nice sometimes to find things that are not considered trendy but suit my body type and therefore don’t look silly being worn currently. I also buy from charity shops because of the money that I can save, a lot of my clothes end up with oil/varnish or paint stains on them which renders them out of general circulation in my wardrobe. It is all well and good to try and have clothes that are ok to ruin but when you need to wear them all day every day they get a bit boring and also some days the jobs you are doing shouldn’t be messy but something happens and you end up with paint on you as a volunteer needed you to open a paint tin or find something in the back of the paint locker, and voila you have paint on your ‘nicer’ pair of clothes. Ok so that last paragraph refers mostly to when I’m living/working on ships and now that I am back home I get to lounge around in cardigans that are just totally impractical on ship. Which means essentially I have two separate wardrobes! whilst fun this can produce issues certainly wrt to making my own clothes: Do I make nice floaty/girly/impractical clothing which I can only use half the time or make the more practical clothing like T-shirts which run the risk of being damaged? Do I try and combine the two sets of clothes into one wardrobe? Or do I keep them as separate as possible and just face the fact I might have more clothes than is truly necessary, but keep from ruining more clothes than I need to?